There is no way to chose second and others GPU to stress-test them. Please, point me how to chose 2nd GPU ? FurMark is an OpenGL app and only the main graphics adapter can be used. But on some systems with some drivers, you can choose another GPU. Notebooks with Intel iGPU and GeForce dGPU have similar context menu entry. But!) 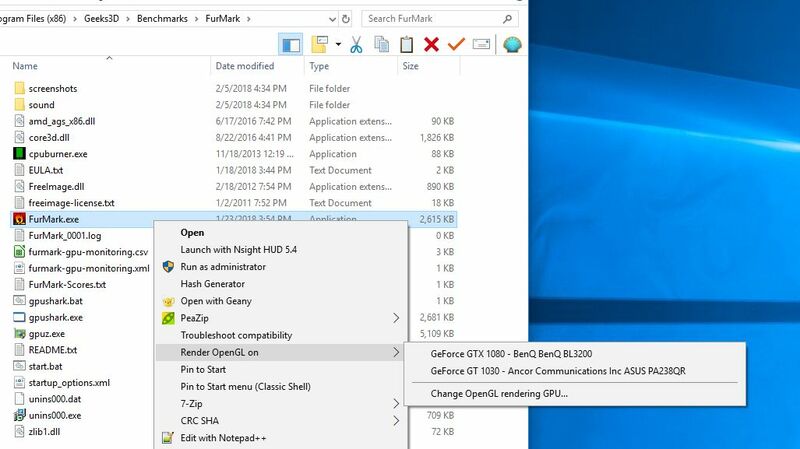 On "GPU Caps Viewer" and "TechPowerUp GPU-Z" there is option to chose whether integrated GPU or additional GPUs to watch tech info and run OpenGL, OpenCL, Vulkan demos. GPU temperature, GPU core and mem clocks are 0.
changed in the config file (log_gpu_data_polling_factor attribute). * fixed the GPU temperature reading on some Radeon GPUs like RX 400 series.
! GPU temperature spike filter is now disabled by default.